Sounds delicious and it is! 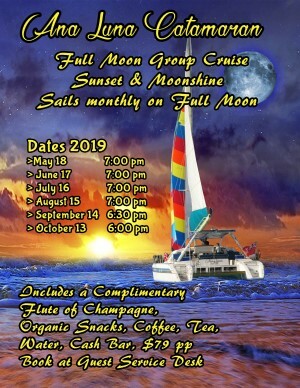 Ana Luna sails several time weekly from Grotto Bay resort on this memory making, stimulating & relaxing Sunset Cruise. Departing Grotto Bay dock two hours before sunset, Ana Luna sails past Bermuda’s most concentrated historic relics into the vast expanse off the North Shore with big views from Royal Navy Dockyard in the west to Ft St Catherine to the east. 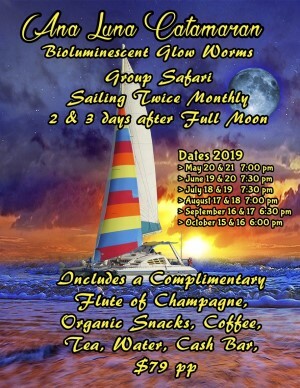 Champagne and light organic snacks are included in this two hour scenic cruise which arrives back to the dock in time to ready yourself for dinner and bring on the night! Two glasses of complimentary champagne are included, one at the beginning and one at the end of the cruise. Mid cruise is cash bar with beer, wine, champagne, margaritas and swizzle available for purchase. For further information please contact ana-luna-adventures@hotmail.com or call 504-3780.